Hi, thank you for visiting my shop and checking out this Easter bundle! 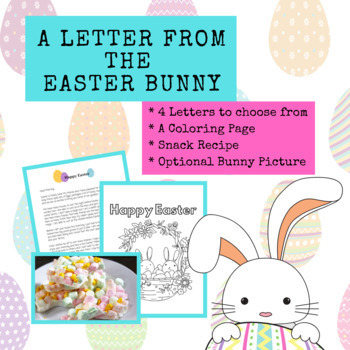 * A picture of the Easter Bunny FROM the Easter Bunny - this picture can be printed on photo paper or on regular paper (which is what I have shown), put into a frame, and used as a fun gift for your kiddo. If you look at the photos with this listing, you will see this optional picture. Imagine your little one getting a picture from the Easter Bunny! Again... thanks for checking this out, all sales go to fund our Little Library which you can learn more from my blog BlueEyedMama.com! This listing should be easy to print, should you have an issue, make sure that your Shrink to Fit tab is checked on your printer options or feel free to contact with questions. Thank you!